Hayley Mills as Kathy in Whistle Down the Wind, released in August, 1961. Hayley Mills is best known for being a type of performer who became celebrated for being in films from the Disney studio. Tremendously talented and appealing, Mills made a huge impression in the baby-boom years. Born in post-war London, Marylebone is right in the center of the city. Her parents were the actor John Mills and her mother was writer / actor Mary Hayley Bell. The two had met while John was on tour in China. They were married while John was on leave from the army, with daughter Juliet coming along in November of that year, Hayley in 1946, and son Jonathan in 1949. In 1958, John Mills was set to star in a gritty crime film Tiger Bay (released in March, 1959), where a child is a witness to a murder. Director J. Lee Thompson was looking for a boy to play the role, but when Hayley auditioned, he changed his mind; the film was popular, and Hayley's path opened. 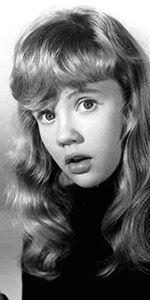 A producer at the Disney studio, Bill Anderson, saw Tiger Bay and suggested that Hayley Mills be given the title role in their adaptation of the popular children's novel Pollyanna (which would play the Chinese in July, 1960). Not only was the film popular, but Mills, now practically a superstar, bagged the last "Juvenile" Oscar for it. Anxious to get another film with Mills going, Pollyanna director / writer David Swift adapted and directed Mills in a double role of two seperated twin sisters in the famous The Parent Trap (released in June, 1961). The hit film had Mills sing a duet with herself onscreen "Let's Get Together" which became beloved by a whole generation of young girls. A book her mother Mary had written was to be filmed in Britain, and since there was a large part for a young girl in it, Haley Mills got the part. Whistle Down the Wind (released in August, 1961) was a big hit in Britain and elsewhere. Back in Burbank, Mills would star with Maurice Chevalier in the Disney adaptation of Jules Verne's Les enfants du capitaine Grant, In Search of the Castaways (released in November, 1962). It became the third highest-grossing film of the year. Now Mills was pressed into work mode: Disney's Summer Magic (released in July, 1963), then torments governess Deborah Kerr in The Chalk Garden (released in April, 1964), then upset the plans of jewel thieves in Disney's The Moon-Spinners (released in July, 1964). Hayley Mills' next Disney film would be That Darned Cat! (released in December, 1965), which became another solid hit. Her mother Mary wrote, and her father John directed Sky West and Crooked (aka: Gypsy Girl - released in January, 1966) which flopped, but Hayley and John Mills starred in The Truth About Spring (released in March, 1965), and starred with Rosalind Russell in the wildly popular The Trouble with Angels (released in March, 1966). Hayley Mills innaugurated her adult career with The Family Way (released in December, 1966), and proceeded to marry the film's director, Roy Boulting in 1971. Working in Britain for a time, Mills appeared in A Matter of Innocence (aka: Pretty Polly - released in October, 1967), Twisted Nerve (released in December, 1968), Take Girl Like You (released in December, 1970), and made her West End debut in a revival of Ibsen's The Wild Duck in the 1970, season. Mills then starred when her husband took over directing Mr. Forbush and the Penguins (released in 1971), replacing Susan Fleetwood. The film was a huge, expensive flop. She starred in Agatha Christie's Endless Night (released in October, 1972), and Deadly Strangers (released in April, 1975). She starred for Roy Boulting again in The Kingfisher Caper (released in June, 1975). After taking several years off from films and divorcing Roy Boulting, she did very well in a television mini-series, The Flame Trees of Thika, aired on ITV in September, 1981. This lead to two appearances on The Love Boat over ABC in February, 1979, February, 1980, and two episodes in early and mid May, 1985. Swerving back into the Disney orbit, she undertook roles in The Parent Trap II, aired over ABC, in July, 1986, The Parent Trap III, aired over NBC, in April, 1989, and Parent Trap Hawaiian Honeymoon aired over NBC in November, 1989. She also played the lead in the television series, Good Morning, Miss Bliss, aired over the Disney Channel in the 1987-1989 seasons. In 1991, Mills toured in an Australian production of The King and I. She appeared in a documentary about her father, Sir John Mills: A Century in Films aired over Australian Broadcasting Corporation in March, 2005, and appeared in the television show Wild at Heart over ITV1 for eight seasons beginning in 2006 season. Most recently, Mills has appeared in Mandie and the Cherokee Treasure (released in 2010). In 2012, she starred in a stage production of Ladies in Lavender in Northampton, then toured the UK with it. She has recently toured Australia with sister Juliet in Legends! Grauman's Chinese Theatre, Hollywood, California. Hayley Mills Forecourt ceremony, Saturday, February 22, 1964. 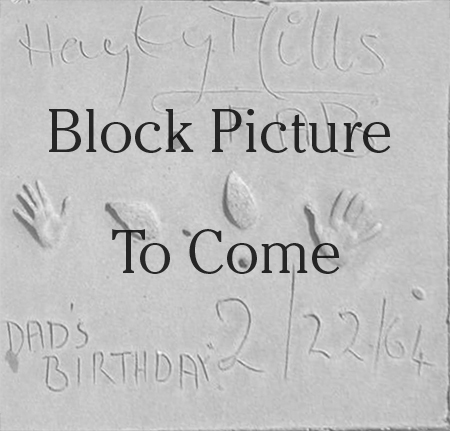 Hayley's father, John Mills and mother, Mary Hayley Bell Mills help their daughter Hayley into the cement.